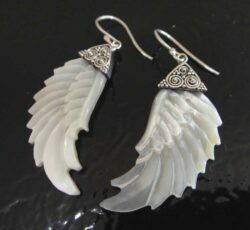 Handmade seraphinite jewelry from Glassando is an excellent choice for anyone who enjoys green jewelry, unique natural gemstones, or opaque stone jewelry. 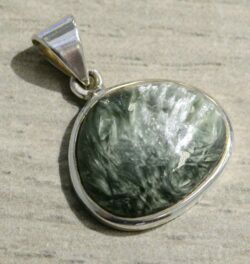 Our selection features seraphinite pendants, seraphinite and sterling silver jewelry, and more! 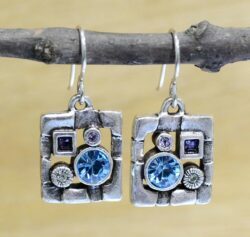 You can view these and lots more handcrafted jewelry here on our website or inside our Iowa City jewelry store. 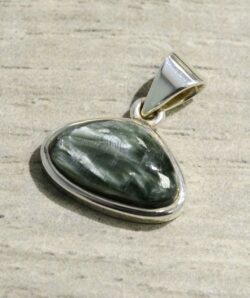 Artisan seraphinite is available from Glassando, here on our website and inside our Iowa City jewelry store! 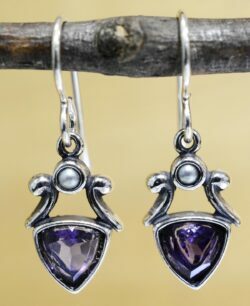 This lovely dark green gemstone is sure to delight lovers of uncommon natural gemstone jewelry or handmade accessories. Our selection of seraphinite and sterling silver jewelry can also be viewed inside our retail store, along with many other handmade pendants, necklaces, bracelets, earrings, and rings! Glassando is located inside of downtown Iowa City’s Old Capitol Mall, which can also be called the Old Capitol Town Center or the University Capitol Center. It can be found next to the University of Iowa Pentacrest. Parking is available in the Capitol Street Parking Ramp, which is attached and offers your first hour for free!